It’s Wednesday! Linda is our hostess this week and has designed this fabulous sketch for us at Freshly Made Sketches. I found this sketch really interesting and think it’s a perfect one to show off your DSPs. The spotted designer series paper I’ve used is from Etcetera, a DSP pack that I consider to be quite vintagey, but I think it works for a cleaner card too. I’ve done a bit of fussy cutting (as usual!) and cut out the leaves and flower from Fabulous Florets. Head over to Freshly Made Sketches and take a look at the gorgeous cards the Design Team have created this week. I love how you “cleaned up” this DSP! This is gorgeous! And is that Smoky Slate? Beautiful neutral! Elegant, gorgeous and oh that flower!! Fantastic! Oh, polka dots and flowers look so good together! Narelle, this is so beautiful! I am always in awe of how you incorporate those layers! Love all of that fussy cutting! You have infinite patience with those scissors! Gorgeous fussy cutting as usual! Love the scallop border as well! Polka dots and scallops — two of my favorite things! Love the pretty flower with this, too. Beautiful card, Narelle! Love the cut out layered floral stem and the pretty colors on this lovely card! Beautiful card Narelle! I’m loving the polka dots! Your fussy cutting is amazing! 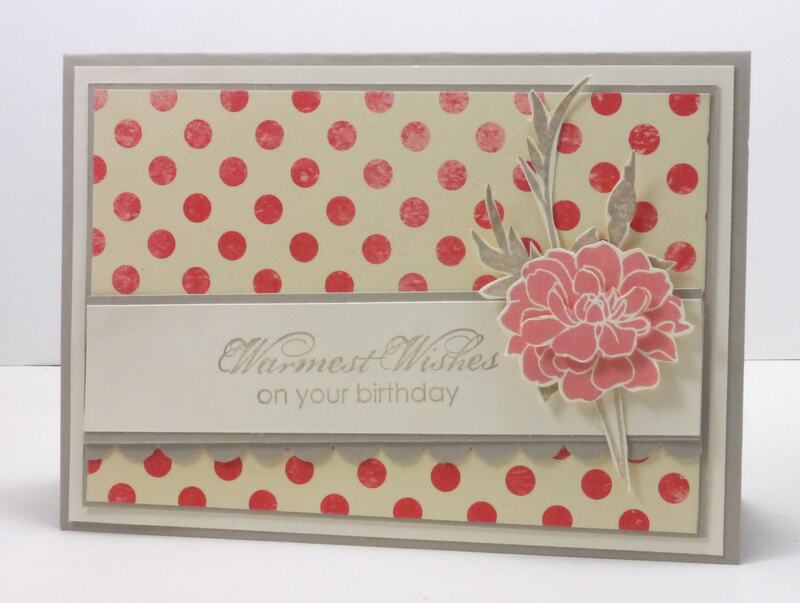 Another gorgeous card, Narelle! I love the colors and that distressed dots DSP! The layered fussy-cut flower is divine, as always!